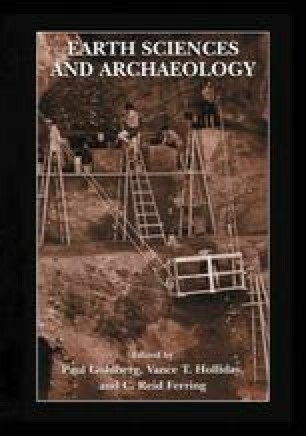 Accurate construction of archaeological stratigraphy has long been recognized as crucial in providing a solid chronocultural framework for discussing past behavioral activities and their linkages with geological processes (Gasche and Tunca, 1984; Harris, 1979). As a consequence, a major effort during excavation has been directed toward the definition of individual strata and their spatial variations. This goal has been accomplished through careful observation of the properties of the sedimentary matrix and its organization in three-dimensional space. The interfering effects of natural agents and human activities on the accumulation of the sedimentary matrix has been considered by some to conform to the principle of stratigraphic succession—as elaborated by earth scientists—and thus conforming to geological laws (Renfrew, 1976; Stein, 1987). Others have strongly argued that the rules and axioms of geological sedimentation cannot be applied to archaeological layers because they are produced by people and thus constitute an entirely distinct set of phenomena (Harris, 1979; Brown and Harris, 1993). Understanding the processes involved in the formation of archaeological stratification has also long been a question of passionate debate, with the views of human or natural deposition being opposed to the theory of biological mixing (Johnson and Watson-Stegner, 1990). These contradictory perceptions have been tentatively reconciled by the recognition of the inherent general complexity of archaeological stratigraphy, that can be isolated into its lithostratigraphic, chronoslratigraphic, and ethnostratigraphic components (Barham, 1995; Gasche and Tunca, 1984).